Start your private morning safari on Komodo Island with a half-hour ranger-led walk to Banunggulung, a distance of approximately 1 mile (2 km). 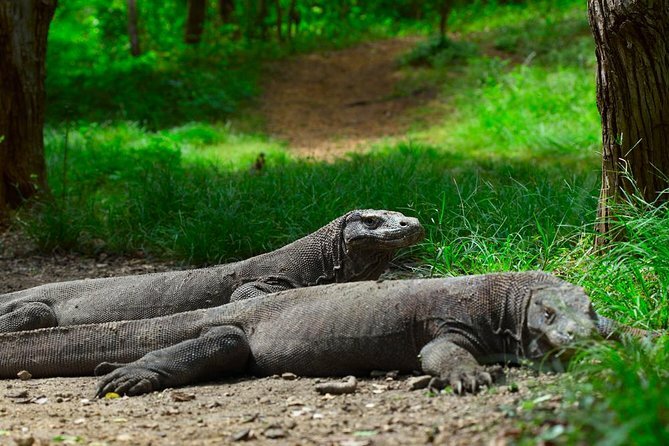 Here, your guide will point out Komodo dragons in their natural habitat. opportunity to swim and snorkel at Pink Beach (Pantai Merah) in the afternoon. En route to Komodo Airport, view the traditional market in Labuan Bajo, boasting a wealth of local goods such as fruit, seafood and meat. The cruise was good, going to Rinca Island first and then spending the first night offshore from Komodo. Ari, our guide, was extremely helpful dealing with a problem I had with an ATM in Labuan Bajo, and later being better than the local guides at Rinca and Komodo, as well as pointing out interesting features when we went snorkelling. The crew of the Kantartika was also extremely good, starting with Captain Mahmoud, with his two sons who will probably take over from him when he retires, Chef Richard how he managed to prepare some delicious dishes in such a small galley was a miracle, and dinghy handler extraordinaire, the red headed Hans. There was another person on board that I did not get his name and never found out what he did. The cabin was fine and the shower and toilet facilities were also good.I have to admit that I expected a larger cabin for the cost of the trip but the boat did have a sun deck, which was a delight. The last night is spent offshore Labuan Bajo, which seems a bit strange to me. The last day, is spent going to a cave and getting to know some of the features of Labuan Bajo. All very good, and Ari as our guide went beyond his remit and made the trip truly memorable. Certainly, without him we would not have seen as much as we did. Any things very good! quite cool trip we have done.